Huawei, fresh from launching its new P9 flagship, is back with two new phones with a lower price, designed for the younger market. 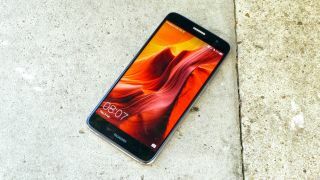 The Huawei Nova is the first of the two, with a 5-inch 1080p screen inside a metal and curved glass body with an advanced fingerprint scanner on the back, 3GB of RAM and a Snapdragon 625 chipset inside. The main selling point will be the battery life: at 3020mAh, that's a large power pack for this class of phone, with more juice on offer than you'll see in the Samsung Galaxy S7. Huawei is claiming the Nova packs 30% more battery life than phones powered by the Snapdragon 615 (which powered the previous Huawei G8). The Nova also sports the improved USB-C port on the bottom, along with 32GB of internal storage and a MicroSD slot (which can curiously only handle cards up to 128GB). The camera on the back is a fairly standard-sounding 12MP affair with an f/2.2 aperture, while there's an 8MP, f/2.0 aperture snapper on the front – so low-light selfies should be half-decent. The Huawei Nova+ is almost identical in terms of specs, but boosts the size up to include a 5.5-inch screen (although sadly it's still only 1080p, presumably to keep costs down). The Nova+ camera is also upgraded to 16MP with optical image stabilisation, which will help low-light performance, and the battery is a much larger 3340mAh unit, meaning you'll get an oddly specific '"2.2 days' average use" out of the phone, according to Huawei. • Want to see these phones in all their glory? We've got our detailed hands-on: Huawei Nova review and hands on: Huawei Nova+ review for you to gaze at lovingly.